Take your first step into an exciting world of fantasy adventure with the Pathfinder Roleplaying Game Beginner Box! Within you'll find simple rules to create and customize your own hero, as well as a robust system to run your character through challenging adventures and deadly battles against villainous monsters like goblins and dragons! 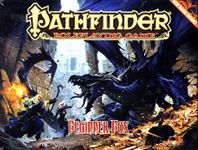 The Pathfinder Roleplaying Game Beginner Box is packed with everything you need to get started with the Pathfinder Roleplaying Game, an imaginative tabletop fantasy adventure game for 2-5 players. Scores of monsters, challenges, and advice give gamers the tools to create their own worlds and adventure, providing countless hours of gaming excitement. With streamlined rules and a focus on action-packed heroic adventure, this deluxe boxed set is the ideal introduction to the world of the Pathfinder Roleplaying Game, and the best starting point for a lifetime of pulse-pounding adventure! Conversions for iconic underdark monsters for use with the Pathfinder Beginner Box.